Glick's citizenship revocation paperwork has yet to be processed, leaving the Knesset with just 119 MKs for the first time in history. 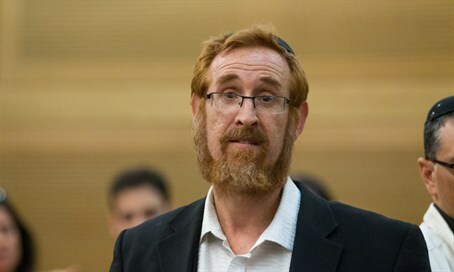 Just 119 members of Knesset (MKs) are serving the Israeli government for the first time in Israeli history Tuesday, due to delays processing the inclusion of incoming MK Yehuda Glick (Likud). Glick still holds US citizenship, which must be cancelled under Israeli law to serve in the Knesset. While he has reportedly paid the thousands of dollars required to revoke the citizenship, as well as filled out the required forms, red tape is holding him back from actually being sworn in. The beginning of Glick's term now rests in the hands of the expediency of the US Embassy in Tel Aviv, leaving in doubt whether he will be allowed to be sworn in Wednesday. Glick, a Temple Mount rights activist and terror survivor, was #33 on the Likud list during the 2015 primaries. He was eligible to serve in the Knesset due to an unusual confluence of political events, including an unusually large vote for Likud, which placed 30 seats in the previous general elections, and the promotion or resignation of various MKs. Glick is being sworn in after the resignation of Defense Minister Moshe Ya'alon.